I kind of have mixed feelings toward the whole DYI craze. Cognitively I know it’s often a really good idea for the environment, for your bank account, for your health and for your sense of accomplishment to do things like make your own yogurt and can your own tomatoes and bake your own bread, but realistically it can be a little hard to put into motion. I mean, sometimes my greatest sense of accomplishment about the day comes from taking the time to rinse and recycle a peanut butter jar rather than simply throwing it away. I try. I promise I do! Sadly, corporations are onto me and my fellow lazy busy well-intentioned members of society. Containers of pre-peeled/pre-cut veggies, packets of pre-made spice mixtures, and bags of pre-shredded cheese stare at us from grocery store aisles saying, “Buy me, buy me! Your life will be so EASY if you just BUY me!” Basically, the fewer steps you have to do, the more expensive a product is. And the more waste and manpower go into creating it. And the more marketed it is. And the more tempting it is to toss it into your cart with a mixture of guilt and gleeful relief. Hashtag-first-world-problems. Sometimes I manage to refrain from buying all the enticing lazy-person products out there, but sometimes I just can’t help myself. It should come as no surprise that baking aisles are already a little bit dangerous for me, especially the chocolate chip area. Who knew there were so many kinds of special delicious add-ins these days?! Things like mint-filled chocolate morsels and neapolitan marshmallows were definitely not around ten years ago. Right? I’ve only recently become aware about the existence of wonderful little things called caramel bits, which are essentially round bits of caramel. Shocker! 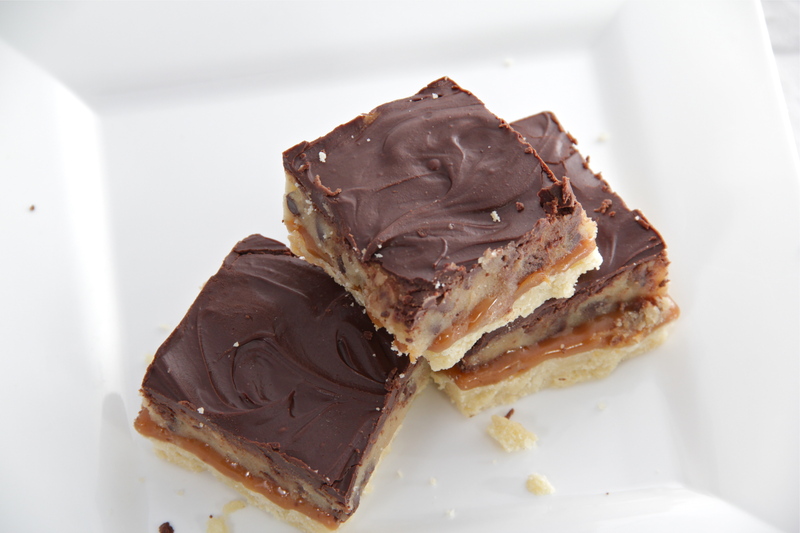 Whenever I do bake with caramel, I usually just use the little plastic-wrapped caramel squares, especially if I’ll be melting them down. The only problem is that it takes for-freaking-EVER to unwrap all those tiny cubes. That’s why it’s so amazing that someone came up with the fantastic idea of making caramel bits that require NO UNWRAPPING AT ALL! It’s a dream come true for nerds like me. 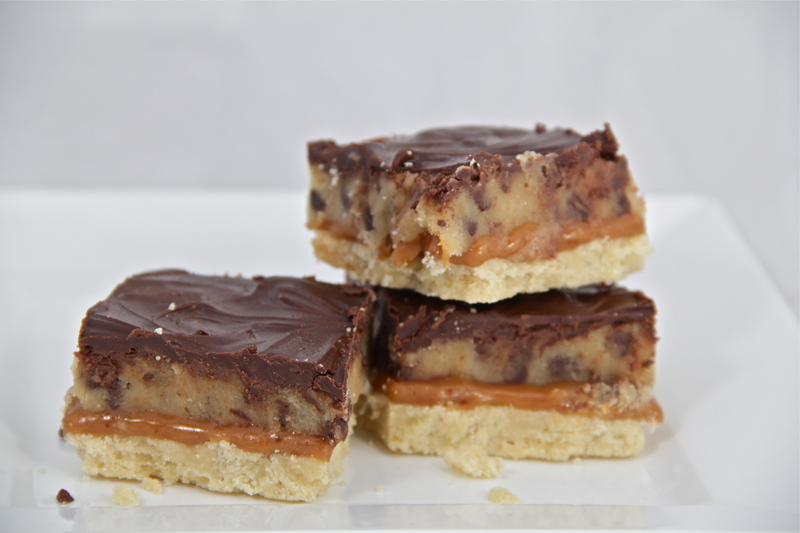 Naturally, I knew it wouldn’t be long before I’d have to incorporate caramel bits into a baking project. Sadly, baking projects don’t happen all that often these days due to my busy college life, but once in a while I find time to clear a space in my cluttered little kitchen and create something wonderful. 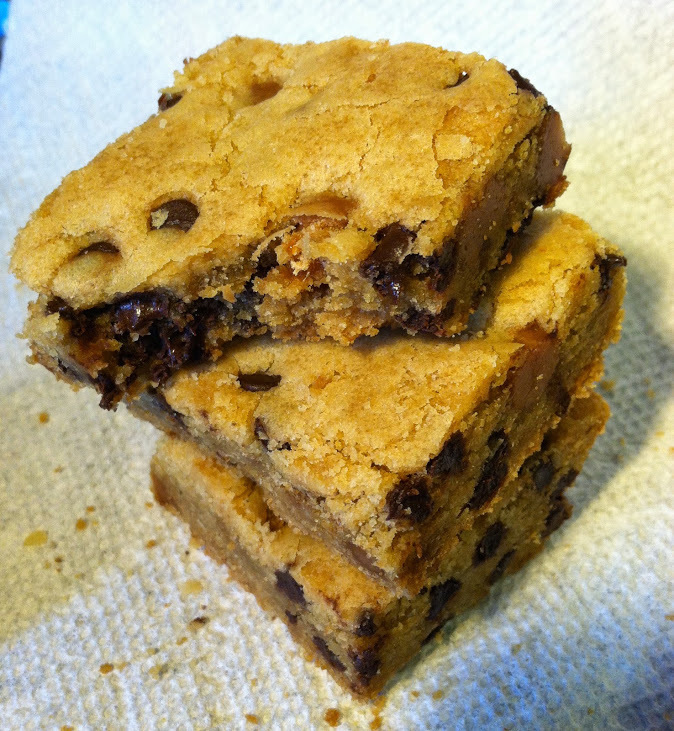 Last time’s something-wonderful was Caramel Chocolate Chip Cookie Bars. 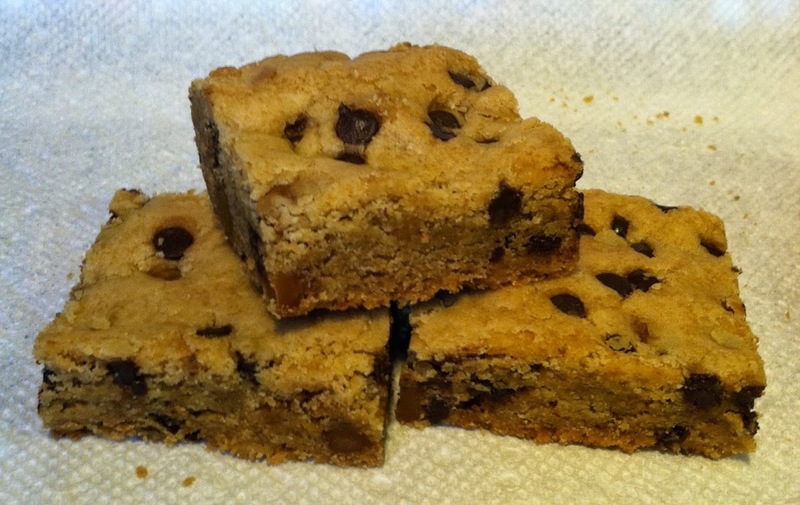 Chocolate chip cookie bars are about as easy as it gets…just your standard chocolate chip cookie recipe pressed into a 9×13 pan and baked until golden-brown. Simple, standard, but always delicious! I won’t even pretend that it’s possible for me to KEEP a recipe simple and standard, so I turned the melted butter from the recipe into browned butter (please don’t laugh, those of you aware of my obsession) and added in caramel bits along with miniature chocolate chips. It was an excellent idea, if I do say so myself. 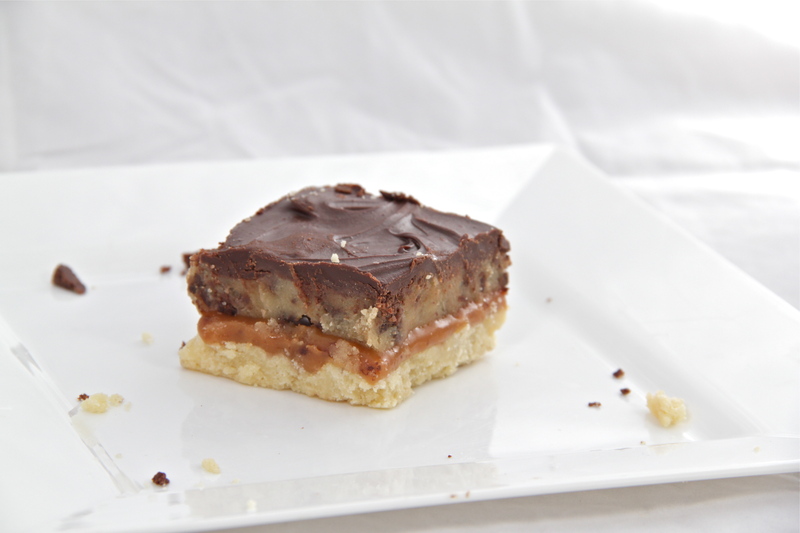 The nutty browned butter paired with chocolate and caramel was a fantastic flavor trio, especially in the form of extra-chewy cookie bars. And I didn’t even have to feel guilty for using my newfound caramel bits since I was saving a step AND saving on waste (because no plastic wrappers)! Totally economical. Totally budget-friendly. Totally healthy. Or at least we can pretend. One thing that these bars definitely WILL bring you is a sense of accomplishment. Because delicious things are always good accomplishments. Remember that! Preheat oven to 325 degrees F. Line a 9×13″ glass pan with tin foil and spray lightly with cooking spray. Set aside. Melt the butter in a small saucepan over medium heat, whisking constantly. Keep whisking as the butter foams and bubbles. When the butter becomes golden-brown and fragrant, immediately turn off the heat and pour the browned butter into a mixing bowl. Let cool for 5 minutes. Meanwhile, combine the flour, baking soda, and salt in a separate bowl. Whisk the sugars into the melted butter until smooth. Whisk in the egg and egg yolk, followed by the vanilla. Stir in the flour mixture just until incorporated. 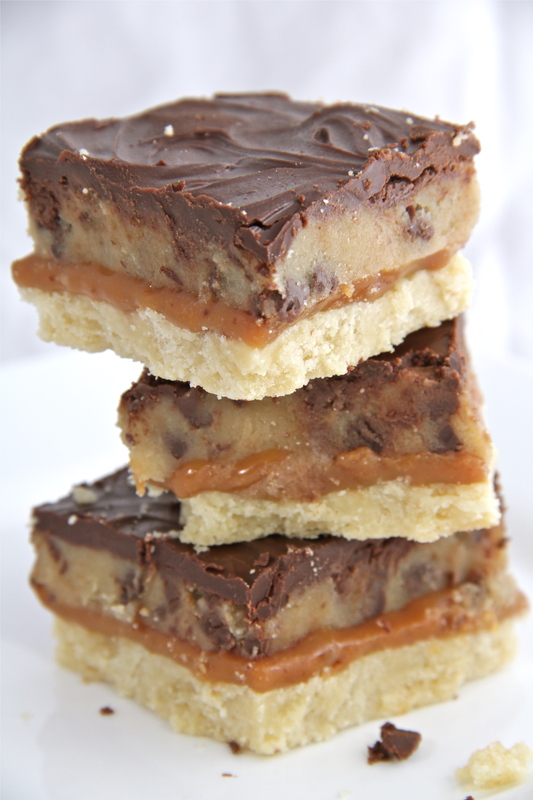 Stir in the chocolate chips and caramel bits. Spread the mixture into the prepared pan and pat down evenly. Bake for 25-30 minutes or until golden-brown. Let the bars cool before cutting. 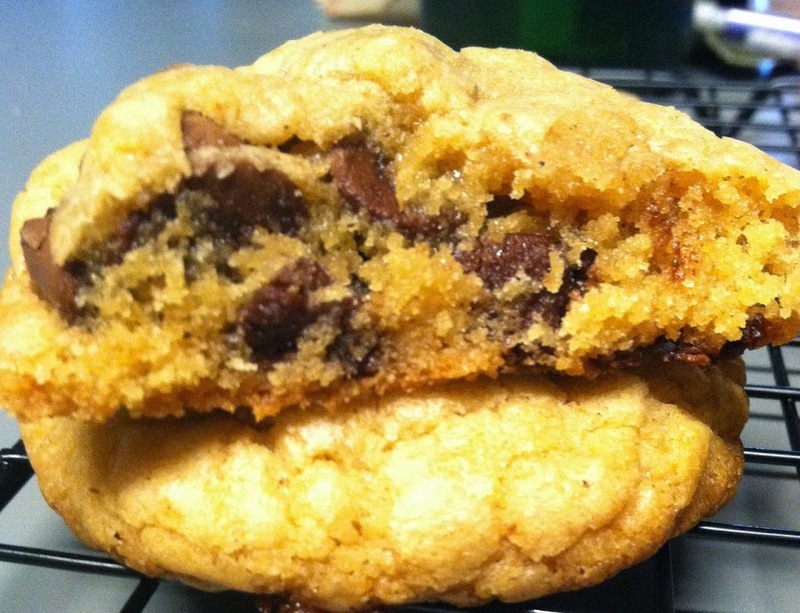 “What’s your favorite cookie?” is a question that will always get a mixed response. It seems as though there are a lot of die-hard peanut butter cookie lovers, a fair share of oatmeal-raisin fanatics, and a handful of sugar cookie devotees. Then there are those with the more unusual responses such as snickerdoodles, molasses crinkles, white chocolate-macadamia, and shortbread. And of course there is the chocolate chip cookie crowd, which may be the largest of them all. 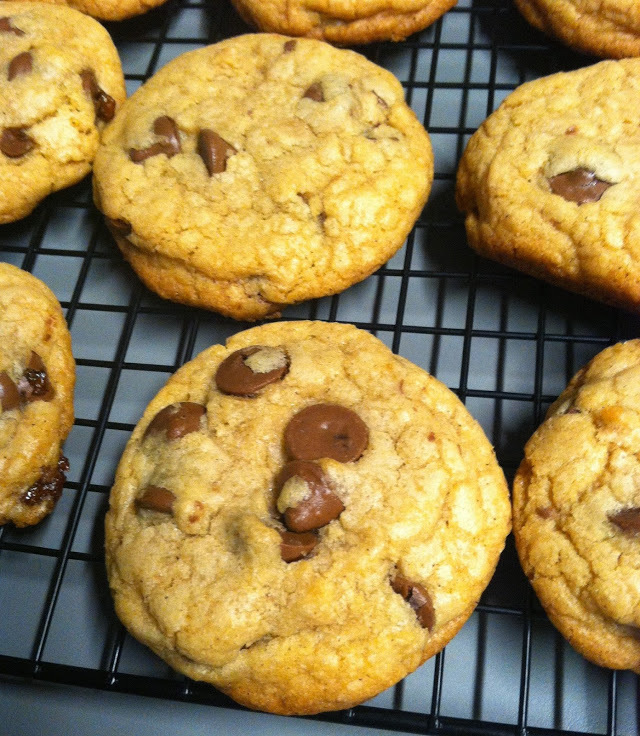 Personally, chocolate chip cookies are several spaces down on my list of favorites, but I have lots of friends and family members who love nothing more than a “really good chocolate chip cookie.” That may mean thin and crunchy, thick and chewy, soft and cakey, or crisp-around-the-edges-chewy-in-the-middle depending on the person. Believe me, some people are pretttty darn specific when it comes to their cookies. First of all, I found a recipe that used browned butter as the base. My obsession with browned butter is becoming somewhat comical–I honestly can’t remember the last time I made a recipe with regular butter. It’s just so easy to make browned butter, and the flavor is so phenomenal! Since browned butter+cinnamon=amazing, I spiced things up even further with a pinch of cinnamon. (<–Pun alert! Spice…cinnamon…ha.ha.ha?) And finally, instead of using normal chocolate chips like semisweet or milk chocolate, I pulled out the big guns, aka Milk Chocolate Morsels with Caramel Filling. Browned butter and cinnamon is fantastic enough, but adding caramel to the mix? Gah. 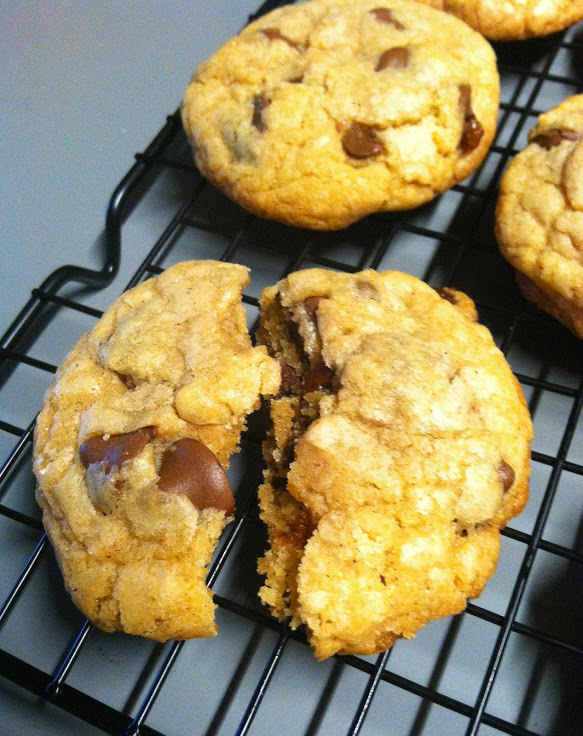 I was also quite impressed with the recipe I used for the base of these cookies. The extra egg yolk, extra vanilla, high brown sugar:white sugar ratio, and precise amount of flour made for super-thick, super-chewy cookies. I chose to make them a bit larger than your average cookie (think in between bakery-sized and mom-made sized) which was a good life decision. 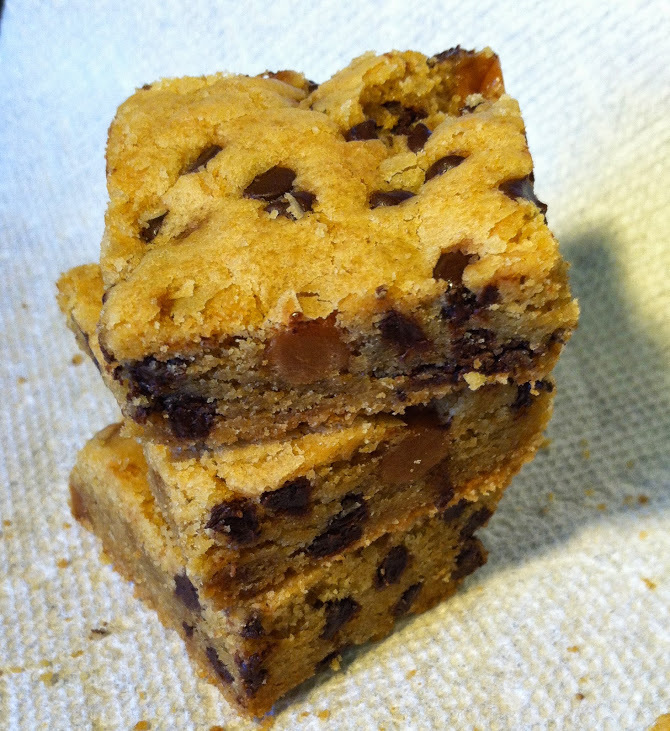 They ended up with that great crisp-around-the-edges-chewy-in-the-middle texture that seems to please almost everyone. The trick is to take the cookies out of the oven when they’re just barely done, so they can finish cooking on the baking sheets. That way the centers stay nice and soft! 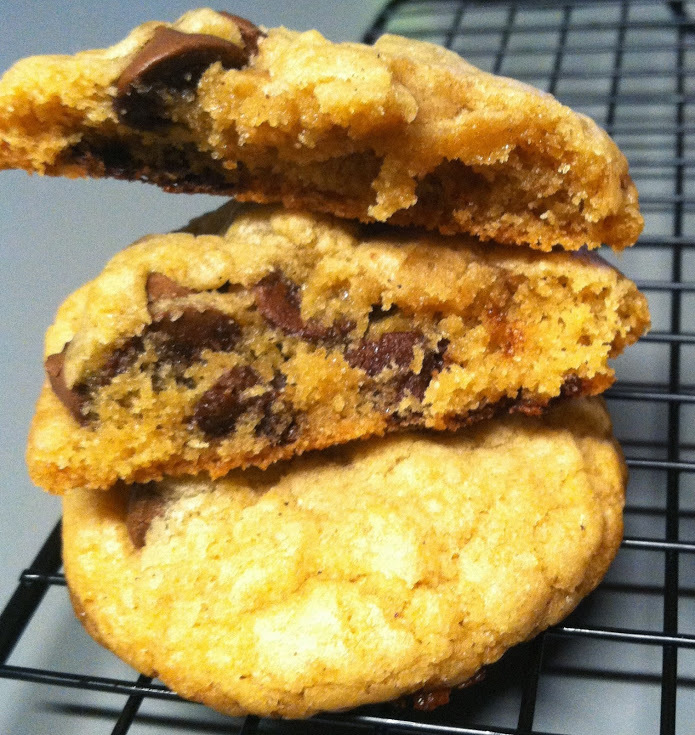 If you’re like me and enjoy adding a little something extra to old-fashioned favorites, try out these Extra Special Chocolate Chip Cookies. They’re kicked up a notch in flavor and were loved by everyone who tried them! Maybe someday I’ll be brave enough to bake a good old fashioned batch of chocolate chip cookies, but today is not that day. And honestly…who’s complaining? Preheat oven to 350 degrees F. Line cookie sheets with parchment paper or silicon mats. Melt the butter in a saucepan over medium heat. Cook, whisking constantly, until the butter is amber-brown and fragrant (about 5 minutes). Be careful not to cook for too long, or the butter will burn! Pour the browned butter into a large mixing bowl and let cool slightly. Meanwhile, in a separate bowl, whisk together the flour, baking powder, salt, and cinnamon. After the butter has cooled for a few minutes, beat in the sugars until smooth. Add in the egg, egg yolk, and vanilla, beating until well-combined. Gently stir the flour mixture into the wet ingredients, mixing just until combined. Fold in the chocolate chips. Scoop the dough into 2-tablespoon sized balls. Place on the prepared cookie sheets 2 inches apart. Bake for 14-16 minutes or until edges are slightly golden and centers are set. 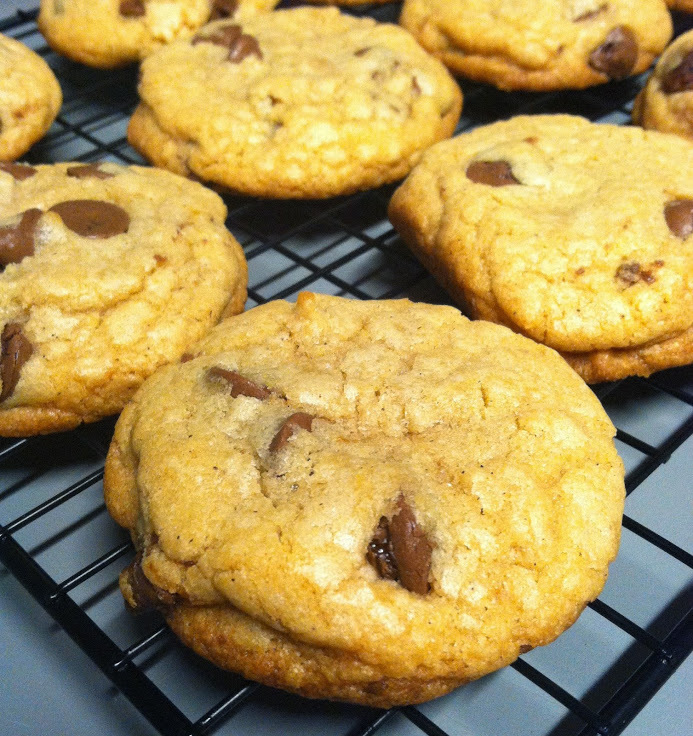 (If making smaller cookies, decrease baking time.) Let the cookies cool for 5 minutes on the cookie sheets before transferring to a wire rack.